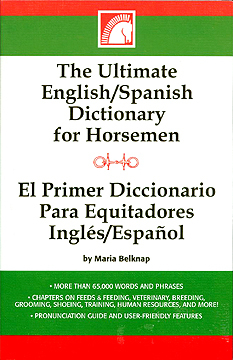 Written specifically for horse people, the dictionary covers topics and words that regular English-Spanish dictionaries might not. For example, horse health care, feeding, grooming, tack and equipment, and breeding terms are part of the more than 10,000 topically grouped word and phrase entries commonly used in the horse industry. Additional features include a “points of the horse” illustration labeled in both Spanish and English, regional variations, and a pronunciation guide.